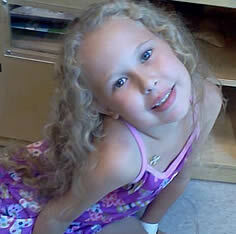 Chelsea was six years old when she was diagnosed with Acute Myeloid Leukemia, a rare cancer of the blood. Her family was completely overwhelmed when they heard the diagnosis but knew they needed to get Chelsea started on treatment right away. For the next seven months, Chelsea was an inpatient at the hospital undergoing multiple rounds of chemotherapy and countless blood transfusions. The hospital became her and her family's second home. After an exhaustive hospital stay and rigorous treatment regime, Chelsea's family received the good news: Chelsea was in remission! She was finally released from the hospital but still came back regularly for routine check-ups. Six months later, after one of these regular follow-up visits, Chelsea's blood work came back abnormal. After further testing, the doctors discovered Chelsea's cancer had returned. She began chemotherapy for a second time, followed by radiation and more chemotherapy to prepare her for a blood cord transplant. During this process Chelsea's mother, Cassi was put in touch with The National Children's Cancer Society. "I didn't know what to expect or what kind of help they offered," Cassi recalls. "I never could have imagined the financial support I received from them." The NCCS helped Cassi and Chelsea with travel costs, meal assistance, and other general expenses associated with Chelsea's treatment. "I had taken a leave of absence from work and had no source of income; the money I received helped out so much. I am so grateful," said Cassi. Chelsea has been in treatment for over a year but her journey is nowhere near over. Because her immune system is so weak, she will have to have to remain virtually isolated for the next six to nine months after treatment ends to limit her exposure to potential infection. Throughout it all, both Chelsea and Cassi remain optimistic and are looking forward to her full recovery.